Broad strokes about being all-in on public cloud or on-premises data centers don’t make sense any more. It wasn’t that long ago that Amazon CTO Werner Vogels routinely said that any strategy that included on-premises data centers and the public cloud was really just a path to public cloud. Yet today, AWS touts architectures that include both. Microsoft has gone a step further with Azure Stack so that the public cloud vs. data center experience is as seamless as possible for its customers. Google, meanwhile, continues to invest in technologies that admit that some services will stay in private data centers (but you might as well make nice APIs for them, while also making it easier for on-premises business logic to consume public cloud services). When it comes to the public cloud vs. on-premises data centers, what has long been framed as an “either/or” proposition is increasingly becoming an “and” reality. Over a year ago, in fact, IDC told us that 55% of organizations are using both. As those implementations gain momentum, knowing what’s right for you has a changing definition of “you.” “You” used to mean that the CIO and the entire IT organization was all-in on public cloud or on-premises data centers for all applications. But the closer you look, the more nuanced that becomes. An IT Ops team typically has dozens (if not hundreds) of applications whose infrastructure they are responsible for maintaining. Some applications, like a public-facing website, have huge swings in demand that correspond to different hours of the day when customers might be interested different products and services. For applications like that, which tend to have non-sensitive data on them, the public cloud makes perfect sense so that the elasticity of demand can be more closely matched with compute expenditures rented by the hour. Other applications might have an internal audience without wild demand swings and sensitive financial data. This class of applications is a much better fit for hosting in an on-premises data center, where additional security can be put in place, and over the long term, the capitalization of assets works out to a better cost. When “you” means IT Ops—and a hosting analysis of what are mostly monolithic applications is being made on a case-by-case basis with the help of tools like Cloud Management Platforms—the perspective is a bit different than the CIO all-or-nothing viewpoint. That’s why so many organizations are opting for choice. As we see even more nuance with new, microservices-based applications, the definition of “you” changes again. 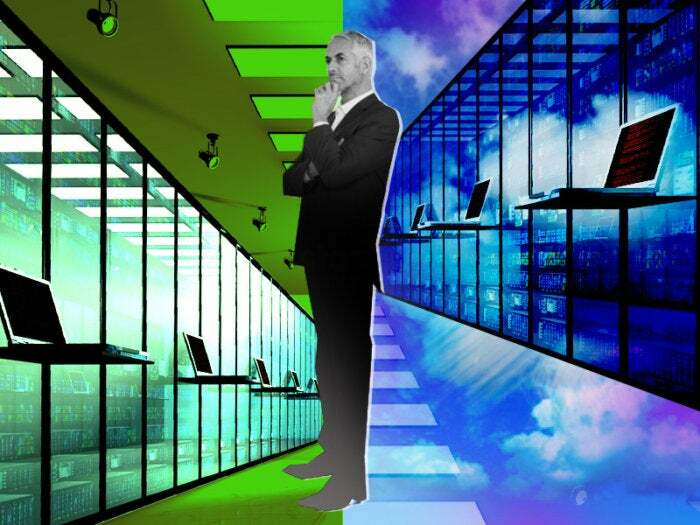 It used to be that “hybrid cloud” and “multi cloud” were two ways of saying the same thing, but as application architectures are increasingly utilizing best-in-breed from different public cloud providers—while running business logic in on-premises data centers in massively hybrid applications—choosing hosting on a case-by-case basis fits the “multi cloud” moniker. For example, business logic for an application can run on a Kubernetes cluster on-premises, but take advantage of stateless services from public clouds for augmentation. One example is using Google Translate to support any number of languages on the fly for content directed at customers, but using AWS Comprehend for sentiment analysis of user comments, to detect how positive or negative they might be. Mixing and matching on-premises infrastructure with services from different public clouds in this way can lead to innovation for development teams without tying them to a specific provider for all the pieces of an application. When seen in this light, it is easy to realize that “hybrid” is a much better description of this architecture than how that term was used previously. Massively hybrid applications could easily have a future where an application starts its life with business logic on public cloud, consuming PaaS services because that scales down so well and encourages the risk taking necessary for finding innovation through software. Some of these apps won’t develop a following and will vanish, but others will achieve predictable scale. That’s when it’s time to move on-premises, like Dropbox did as it was preparing for its IPO, saving $75 million. Still, there are situations where it might make sense to move pieces on-premises but continue to consume the PaaS services. Broad strokes about being all-in on public cloud or on-premises data centers don’t make sense any more. Increasingly, the decision is made on an application-by-application basis, if not a component-by-component basis. Those choices need to be revisited for new applications frequently as demand changes. One size no longer fits all, but neither do the choices. Choose the route that provides the speed necessary to iterate your way to innovation and achieve long-term cost controls. Pete Johnson is a Technical Solutions Architect at Cisco, covering cloud and serverless technologies. Prior to joining Cisco as part of the CliQr acquisition, Pete worked at Hewlett-Packard for 20 years where he served as the HP.com Chief Architect and as an inaugural member of the HP Cloud team.